A top end rebuild on a two stroke dirt bike is a basic and routine part of maintaining the health and performance of your machine. The frequency and complexity of each rebuild will vary depending on many factors, some of which include the type of riding you do, the age of the bike(and/or hours on the motor), quality of parts used, tools available and so on. Generally I've found I can go about 100 hours on a piston and rings. The piston will last about twice as long as the rings, but a small drop in compression is not a huge deal for me so I usually wait till I do the piston to change the rings. A compression test can help determine when it's time to do the top end. It's a good idea to check your compression for a base number and then monitor the changes in compression as you put hours on the motor. A drop in about 15 to 20 percent means it's worn and time for some attention. The only way to really tell how worn everything is however, is to tear down and do the measurements. A top end job should be done before the piston and rings are worn out to prevent damage and more costly repairs. Unfortunately I hadn't checked my compression when the bike was new or when I did the sx head swap so I didn't have a good baseline to measure from. I did install an hour meter however and since the bike was nearing 100 hours of mostly trail riding, I knew it was getting close. Wash your bike thoroughly with soap and water. Even if your bike looks clean there could be mud or other debris stuck under the frame or in the nooks of the engine. I like to take my gas tank and seat off, plug the line to the carb and air box if you can and wash focusing on the underside of the frame and other areas where dirt could hide and fall into the motor during the project. As I said before, a compression test is a good check and a base line measurement will help determine service intervals. Keep a log and you will be able to look back and see trends. With the compression tester threaded into the head, get on the bike and kick it hard about ten times with the throttle open. The pressure will build as you kick and the highest reading is the one you are interested in. Try to be consistent in how you measure to get a proper perspective. Kicking harder leads to higher readings to be consistent there as well. My initial reading before rebuild was about 170psi. Since I hadn't done checks before I didn't know if this was bad or good for my bike, but it was in the area I expected and still considered healthy. Higher elevations will produce a lower compression than the same motor at lower elevations. From my calculations you will lose about 3.3% for each 1000 feet rise in elevation, so a motor that produces 180 psi at sea level will drop to about 156 psi at 4,000 feet. If you ride higher elevations frequently and don't plan on dropping much, you may consider some head modifications to increase compression. A higher compression will help bottom to mid power, but you have to know where to stop and if it will have a bad effect on top end power, reliability, and fuel requirements. I did a head swap to boost the compression and was pleased with the results and the 170 reading. I'd like to be more around 180 to 190 however. This would still be safe for my bike while not affecting top end and not requiring special fuel. Fresh rings will help as would shaving the head(more on this later). Now it's time to remove the cylinder and piston from the bike. 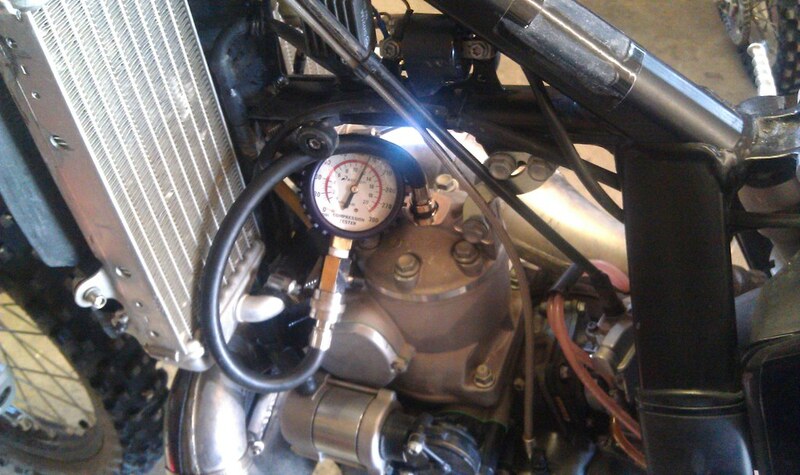 I was doing this top end on my 2010 KTM 250XC. I bought the bike new 10 months prior and this was the first time the top end was disassembled. I knew therefore that most things were going to be in pretty good shape. On the KTM bikes it is not usually necessary to remove the reeds, carb etc. 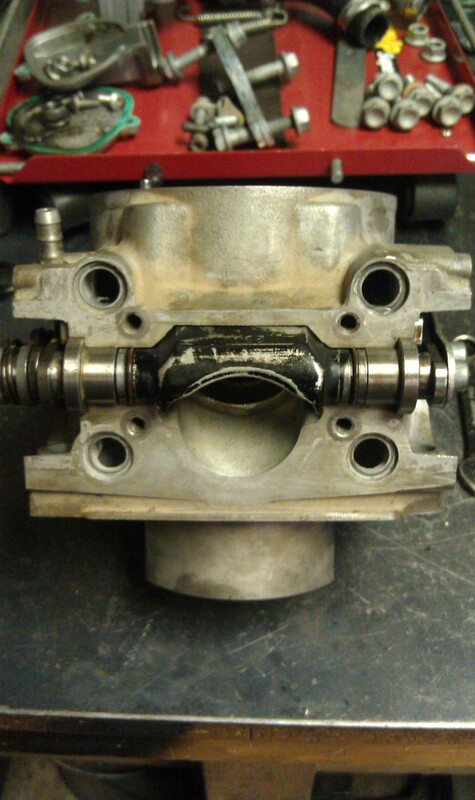 Remove the head first, then the cylinder nuts. 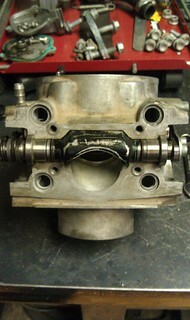 On this model the power valve covers need to be removed to get to two of the cylinder nuts. There is a small clip on the linkage that will allow you to pop the ball off the socket of the linkage and get to the nut. Don't let the clip or anything else fall into the motor! I always stuff a rag or paper towel in anytime I see a potential for something falling into the bottom end. This has saved me more than once. This is especially important for the next step of removing the c-clip from one side of the piston. These things can fly off in any direction if you don't have a good hold on it. 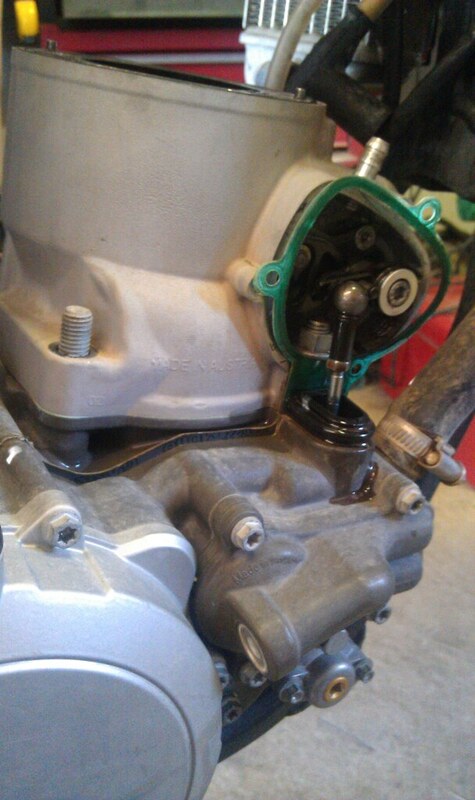 Once it's off, push the wrist pin out with your fingers and remove the piston. With the cylinder removed, wash it with soap and water. Every time you have the top end apart it's a good time to clean the power valve. Oven cleaner works well to remove grime and deposits. Power valves vary greatly between makes and models so have a manual handy and/or take note of how everything goes back together and how it works so you have a good understanding of how to put it back together. Replace any o-rings or seals that you remove in the process and oil the moving parts with two stroke oil as you re-assemble. Make sure everything works smooth and is working properly. Check for wear and play. A manual will have the tolerances. How far you go on the cleaning is really up to you. Any gunk you get off will help. I cleaned it once thinking I was done, then decided to fully disassemble the power valve to replace some o-rings and get more gunk out. I had the o-rings in my kit and decided it was worth the extra time and effort. Use scotch brite on the cylinder to remove glaze working in the direction of the hone marks. Make sure all the old gaskets are removed and never re-use an old gasket. Measuring the bore is done using a telescoping t-bore gauge and a micrometer. Calipers can be used instead of a micrometer, but a micrometer is a bit better. I used both and got about the same measurements. You'll want to measure the bore in different spots to verify, among other things, that there is not too much variation. The tolerances on bore variation etc. will be in your manual. Make sure the bore gauge is positioned across the bore in the widest part. Measure side to side and front to back in different depths. You can take the average to find your average bore. My bore had not worn very much and measured 66.4mm(basically a new bore). 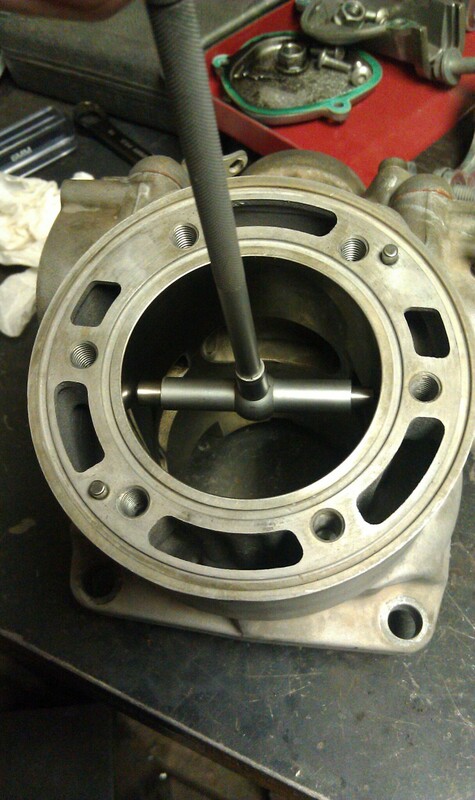 The piston clearance should be about .05mm so I used a 66.35mm piston. If the bore is only slightly worn(.005 inches or .127mm) you can install a Pro-X oversize piston. These come in .001 inches increments. You must measure the bore at the smallest point and allow .002 inches(.05mm) clearance. To measure the piston make sure you measure on the skirt down at the widest point as pistons are tapered and smaller towards the top to allow for more expansion in that area. You shouldn't have to measure the piston, but it's a good idea to double check. A larger clearance can produce piston slap and a decrease in compression, but a smaller clearance won't allow expansion and cause seizing. Measuring ring end gap is next. The gap should be .004" per 1.000" of bore. 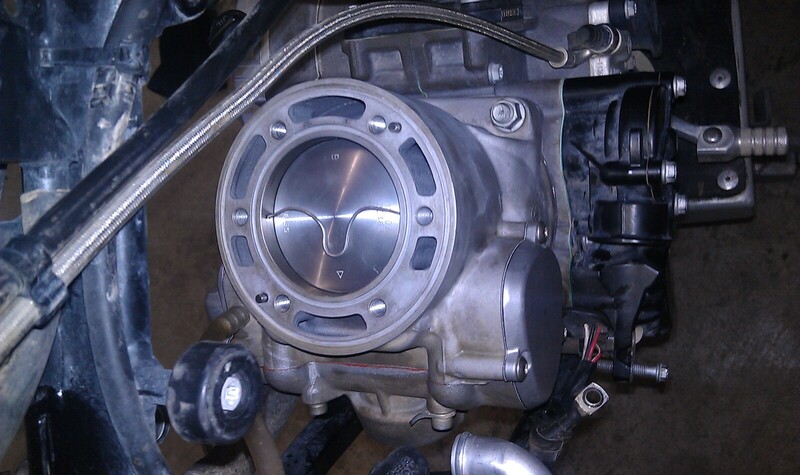 My cylinder has a 2.535"(66.4mm) cylinder bore, 2.535 x .004 =.010. My ring end gap should be no smaller than .010". To measure ring end gap gently push the ring into the cylinder bore so it is parallel and about 1/2" to 1" below the head surface. Use a feeler gauge to measure the end gap. Larger is OK, smaller has to be corrected because it won't allow for expansion when it heats. Use a flat file to remove material from the ends of the ring if needed. Normally, the maximum gap is 0.018–0.025 inch(gap should be between .012 and .024 inches). My old rings measured .031 and my new ones were .019, looks like it was a good time to replace them and the new rings didn't need to be altered. Now on to the assembly. Put the first wrist pin clip into the pin bore. Make sure that the clip is seated in the groove and the openings of the clip are facing up or down. Use a new wrist pin bearing and oil it before installing in the rod. Oil the wrist pin with 2-stroke oil as well. With the new wrist pin bearing in the rod and the arrow on the piston pointing toward the exhaust, slide the pin into the side of the piston without the clip and push through the rod and bearing. Now install the last clip into the piston bore. Install the rings on the piston with the marks on the rings facing up and lined up with the pins in the back of the piston. The arrow on the piston faces forward and the pins are in the back. 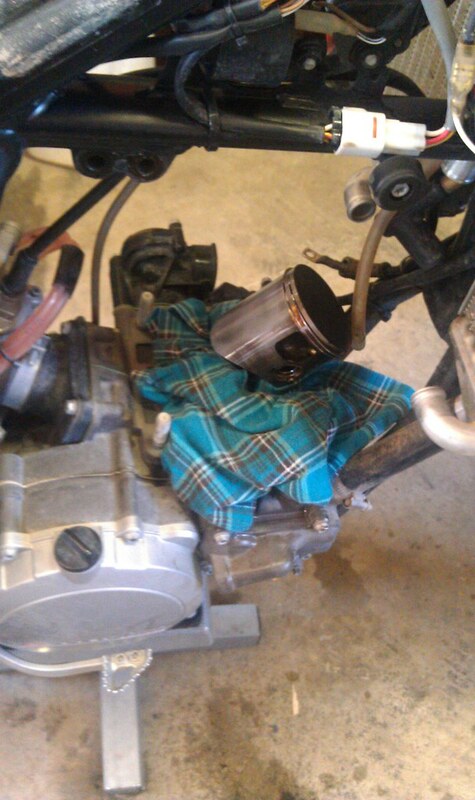 Lightly oil the piston skirt with 2-stroke oil. Install the new base gasket, then squeeze the rings together with your fingers and gently lower the cylinder over the piston. It will go easily if you've measured the gap and they are lined up with the pins. Don't force it. Install the cylinder nuts and torque to spec. Make sure any power valve linkage is attached correctly. Checking the squish is done before final installation of the head. The squish measurement is the clearance between the top of the piston and the head at the closest point(around the outside). The squish band is the area around the outer edge outside of the main combustion area of the head. Getting a good squish clearance can help in combustion efficiency and increase compression. Also, if the piston contacts the head it's obviously a bad deal. Most of the time the clearance is sufficient and you won't have to worry. The squish set at the factory can be large however, so you may get some performance gains here if you want to tinker. As I mentioned earlier, I had previously swapped my XC head for a SX head to get a better compression for higher elevations. Max compression should be kept around 190 to 200psi. The squish can be lessened with a thinner base gasket as well but this changes port timing and depending on model there may not be a lot of adjustment to be had there. The base gasket I used was slightly thinner than stock and reduced my squish somewhat. To measure squish put a piece of solder on the piston as shown inline with the piston pin. The solder should not be solid core and soft enough to squish easily. Also use only a slightly bigger piece than you need. I used a .065" piece. I knew from before my squish measured about.07. Install the head and use the kick starter to push up on the piston and squish the solder. Remove the head and solder and measure the solder to see what it squished to. This is your squish clearance. Mine measured .060. A perfect squish may be more around .048, but this is good. A compression test will tell if the base of the head could be shaved to narrow this distance and get more compression etc. Head mods should be done by a qualified shop. They will need this information and more to do it correctly. Port timing and compression can alter top end performance so take all this into account when planning any mods. When you are happy with the squish, re-install the head and torque to spec in a crisscross pattern. Once everything is together and you've done a proper break in, check the compression again to see what improvements were made and to get another baseline. After break in my compression measured 180psi. Good enough, time to ride! It’s actually a great and useful piece of info. I am satisfied that you shared this helpful info with us. Please keep us up to date like this. Thank you for sharing. God why do people still stick rags in their cases? Even if it is a clean rag lint or fuzz can come loose. Use a perfectly clean plastic shopping bag or a new plastic bag for waste baskets. Places like powersealusa can repair cylinders.